Dirt bike, ATV's or snowmobiling in the Chequameon National Forest is a beautiful scenic experience. Ride on the best trails in Wisconsin! There are approximately 250 miles of groomed trails through the forest. Premium gasoline & oil are available at the resort for your convenience. ATV trails are abundant in Price County. Come and experience the thrill of seeing wildlife while viewing the beauty of nature along the winding trails. 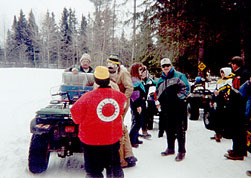 The resort is situated on the East Road, an ATV trail the 300 mile Price County Wisconsin trail system. Snowmobiling in the Chequamegon National Forest is a beautiful breathtaking experience. Ride on the Best Trails in Wisconsin! 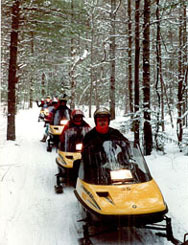 There are approximately 500 miles of groomed snowmobile trails through the forest n Price County. The resort is located on trail 105. Cross country skiing is also available. There are two cross country skiing areas within minutes of the resort; Newman Lake & Wintergreen Acres. Both have ample trails, parking and bathroom facilities. Trail Maps and Guides are available.